A nanowire transistor coated with antibody proteins can briefly snag individual viruses. This simple electronic device sets the stage for sensors and handheld devices that can spot pathogens in the early stages of an infection or attack. Solid oxide fuel cells could one day power individual homes, but they need to be cheaper first. One way to lower their cost is to be able to run them at somewhat lower temperatures. A material originally designed to purify oxygen could hold the key. Browsing the Web on a handheld device can be an exercise in frustration. Various interfaces aim to help users zoom in on relevant content. One prototype lets users rearrange Web pages with a single pen stroke, collapsing unwanted elements and zooming relevant content. Scientists have been using lasers to trap and move individual cells and particles for years. Because laser beams are narrowly focused, researchers have come up with clever ways of manipulating the beams to precisely control objects. Using a broad ribbon of light provides a simpler method: block the path of cells in flowing fluid and let the cells slide along the ribbon to where you want them. 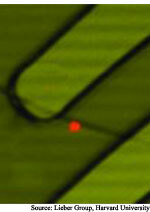 Biochip levitates droplets... Nanotubes form transparent film... Molecules positioned on silicon... Mechanical valve design goes nano... Angles increase optical storage... Crystal links ultraviolet photons.